European coffee is stated to be the best coffee in the world; this is a result of the European standards of coffee beans, roasting and brewing. 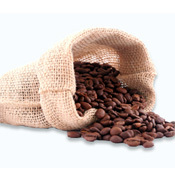 To start we only buy Type I 100% Arabica coffee beans from small estate family owned farms. These beans are the highest quality beans in the world and our master roasters together have over 75 years experience providing the most exquisite cup of coffee from these beans. Our coffee has no bite, no bad aftertaste and is low in acidity providing a medium-strong cup of coffee that is smooth unlike any other coffee experienced in the U.S.